Tri-Ominos is the classic triangular domino game, combining strategy, luck, and new challenges each time you play. Children will be adept at matching numbers wherever possible, and adults will appreciate the strategy involved in making the best moves for the most points. 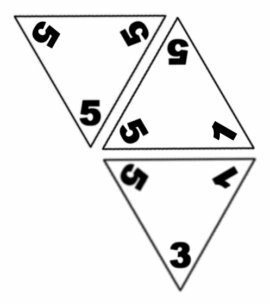 Players begin by drawing several tiles, keeping the numbered sides hidden from their opponents. As each piece is played, points are awarded. New pieces much match the numbers on one of the existing pieces. If you don't have a matching tile, draw from the stock until you get a match. There are penalty points for each tile drawn, but points are awarded when you finally make a match. Certain matches, such as closing a hexagon or building a bridge, earn players as many as 50 bonus points. Tri-Ominos is fun for the whole family. Children will be adept at matching numbers wherever possible, and adults will appreciate the strategy involved in making the best moves for the most points. The first player to accumulate 400 points wins. The remainder of the tiles make up the "well", and are held in or reserve to be drawn upon at need. The player with the highest triple (all three corners the same value) places the first tile. The player receives the total number of points on the tile, plus a bonus of 10. If the first tile happens to be a 0-0-0, the value of the tile is 30 points, plus a bonus of 10, for a total of 40 points. If no one hold a triple, then the tile with the largest point total leads. If the tile is not a triple, then no bonus is awarded. Play proceeds to the left (clockwise). Each player adds a tile to an open edge of the layout, if he can. To add a tile, a player must match two number to one edge of an existing tile. In the illustration to the right, a 5-5-5 started the game, scoring 25 points in the process (5 + 5 + 5 + 10 bonus). A 5-5-1 was then played onto the triple-five. This scored the total number on the tile: 5 + 5 + 1 = 11 points. A 5-3-1 was then played onto one of the 5-1 edges of the 5-5-1. Again, this scored the total number on the tile: 5 + 3 + 1 = 9 points. If a player is unable to make a move, he must draw tiles from the well until he can make a move. If there are no tiles left, then the player must pass. First player to 400 points wins the game. Hexagon - When an hexagon shape is made, the player who finished it receives the points on his tile, plus a 50-point bonus. Bridge - When a tile is added that bridges two parts of a layout, matching one side of a tile and the point of a tile opposite it, the player scored the points on his tile, plus a 40-point bonus. Bridge Match - When a tile is added that matches a bridging tile, plus one side of another existing tile, the player scored the points on his tile, plus a 40-point bonus. Note: Tri-Ominos® is a registered trademark of Pressman Toy Corporation.